Sesame Glazed Baby Back Pork Ribs are the perfect treats for your barbecue. This is an incredibly wonderful recipe that will make your beef, pork, chicken or fish rich in flavor and full of delicious sesame flavor. In a bowl combine all dry ingredients (Cornstarch, Garlic Salt, Pepper) stirring until evenly blended. Follow by placing a small pot over medium heat and adding Jake's BBQ Sauce, Chile Oil, Sesame Oil and blend together. Add dry ingredients and stir until sugar, cornstarch, garlic salt and pepper are smoothly blended into the mixture. Remove from heat and let rest until almost cool. Take rack of ribs and remove any membrane on the underside of the ribs. Wash rack thoroughly and cut in half, then pat dry. Open bag and place the two halves of the rib rack into the bag. Pour 3/4 of the BBQ mixture into the bag over the ribs. Seal the bag removing any excess air. Turn the bag over coating the entire surface of both rib segments with the mixture. After the ribs are coated place the bag into the refrigerator and let rest for 2 hours. Once the bag has rested prepare your grill. Remove the rack from the bag and grill as normal. Start by grilling the ribs underside down first, then following by turning the ribs over. Check the temperature and turn every 15 minutes. Base the top side of the ribs with the reserved BBQ mixture. 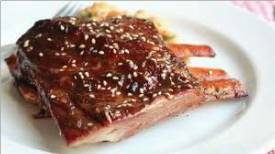 Once the ribs reach the desired temperature remove from heat and sprinkle on Sesame seeds covering all surfaces. You can add more Sesame seeds if needed. Take the reserved BBQ mixture and heat. When ribs are cooked serve with the reserved BBQ mixture. With the ribs marinated and the grill ready place on the indirect side of the grill. Let cook for 15 minutes with the grill lid closed. After 15 minutes open the lid and turn the ribs over then let cook for 18 minutes. After 18 minutes check the temperature. We added 3 minutes to the cooking process to account for the heat loss during the opening and closing of the grill. After each subsequent turning check the temperature using an instant read thermometer. As the ribs near temperature begin consulting the cooking scale to ensure that you bring the ribs out at the right temperature. When the ribs reach 5-10 of the desired temperature remove from heat and place on a covered pan. Let the ribs rest 3 to 5 minutes then serve. Here's our cooking chart reference for Pork Ribs.